Still quite cold in Tokyo because of the huge cold wave covering Japan. There were unexpected heavy snow in colder areas few days ago leaving big snowbound more than 4 meters high which needs more time than usual until its dissolve and the arrival of the spring. However, when we visited Soga plum garden in Odawara, KanagawaW last week, we were able to see most of the plums in full bloom, some already starting to fall as well as wild spring plants blooming in the ditches of the garden. Spring should be here at least by the end of this week or by beginning of next week if we were to believe what our ancestors said as ‘Omizutori’ of Todai-ji ends on 12th and ‘Ohigan’, the equinoctial week in which Buddhist services are performed, will start from 18th which are two common events that are said to be when the season changes markedly. This season’s phrase expresses the marked visionary change, the peach flowers bloom. It is about peach blossoms. ‘Momo’ is a Japanese for peach, followed by ‘hajimete’, meaning for the first time, ending with the verb ‘warau’ meaning to smile in the modern Japanese but classically meaning to bloom. 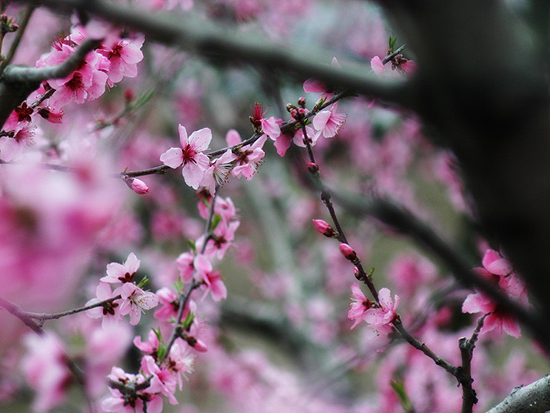 Therefore, the whole meaning of the phrase would be, peach trees start to bloom. It is interesting to know that the old Japanese used the verb ‘to smile’ which we don’t use to express the action of the plants into bloom now. We use the verb, ‘saku’, instead. As we have been explaining several times in the past about the desire of warmer days in winter times of our ancestors as there were less heating equipments in their houses, the verb ‘warau’ tells us their honest feeling of relief that their hard cold days is about to end at last. It is as though a mother seeing her baby in her arms, at last, stop crying and smiles after fondling for a while. 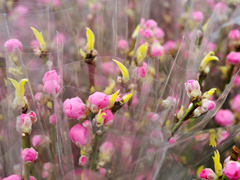 Peach blossoms are indeed a flower that suits the expression of ‘smiling’ at its bloom as of the fair, light pink colours and the cute size of the flowers which gives a sudden life-image to the steel-like branches of the winter to the Japanese. It is as though the hard nature starts to relax its hard strict attitude and smile, letting us enjoy the nice warm weather with its’ natural gifts. 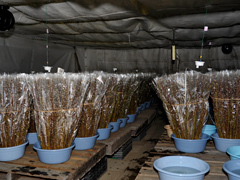 Peach blossom branches kept in cellar for early blooming. Photo from Zen-Noh Ibaraki Site ‘Amore’. Those who have read the former article of Usui, Makkou may find strange as peach blossoms are already in market, used to decorate on Girls Day festival. This is because the peach blossoms used on Girls Day and time earlier are those of the hothouse, more like the cellar, for the early distribution. Peach blossoms ready for the market. Photo from Zen-Noh Ibaraki Site ‘Amore’. Peach is thought to be brought in from China through Korea to Japan more than 2000 years ago. The history of peach cultivation in Japan is written in KojikiW, oldest extant chronicle, and in Nihon ShokiW, the second oldest book of classical Japanese history, which is about in 700’s. Peach was cultivated because it was believed that the fruit is effective for perpetual youth, longevity and the tree effective for evil spirits which was a belief that came into the Japanese Imperial Court from China. It was first cultivated for its flower but in Kamakura periodW, breed improvement for fruit were carried out as medicine which in Edo periodW, some areas as Kyoto became famous for fruit-peach. Arrival of spring. 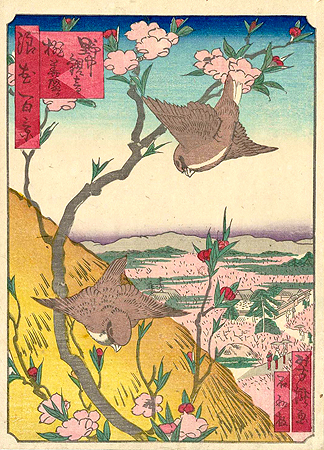 Ukiyoe with beautiful peach branches and spring birds by Yoshitaki Utagawa. Still, it was in Meiji periodW that fruit-peach became more like the fruit-peach we can eat today when various peach breeds were imported from China and Europe. An image of utopia, ‘Tougenkyo’ of the Japanese. Photo from ‘Mori-no-tousan, Kashofugetsu‘. Both fruit-peaches and ornamental-peaches start to bloom at this time of the year in Japan. 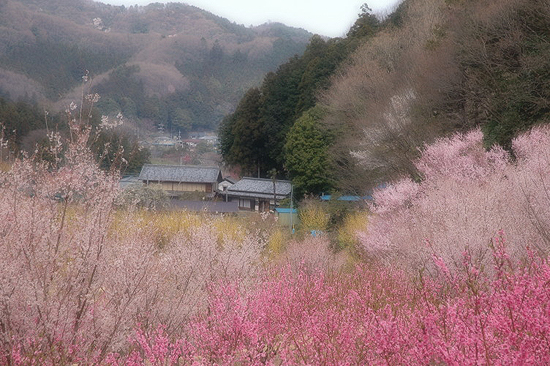 Yamanashi prefectureW produces the most yield in Japan, followed by Nagano prefectureW and Wakayama prefectureW where could be a nice place for you to visit while at bloom which should be giving you an image of ‘Tougenkyo’, The Peach Blossom SpringW, a utopia written in a fable by the great Chinese poet, Tao YuanmingW, who gave great influence to the Japanese classical arts and poetries. A tiny squid about 5 cm long which comes out into market at this time of the year. 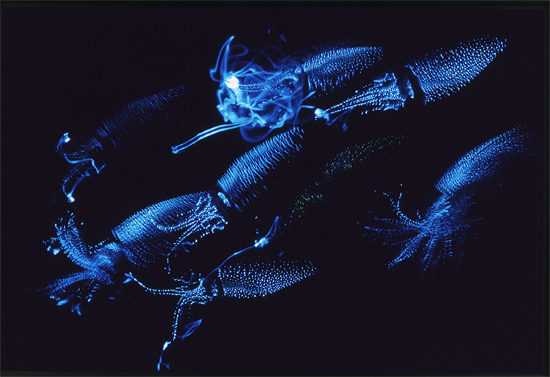 Hotaruika, the firefly squidW, can be caught off Sea of JapanW and some parts of the Pacific side, [W;Namerikawa, Toyama] prefecture with highest haul. It is called ‘firefly’ = ‘hotaru’ as they flash. The oldest record of Hotaruika as seafood remaining is of 1858 which is not that old. Still, as it has been a squid that inhabits all off Sea of Japan and off some parts of the Pacific side, Hotaruika must have been eaten from older times. Flashing Hotaruika at night. Photo from ‘Viva Kids!‘. Swimming Hotaruika. Photo from Totoya, a shop of Toyama prefectue, specialised in Hotaruika and other district seafood. 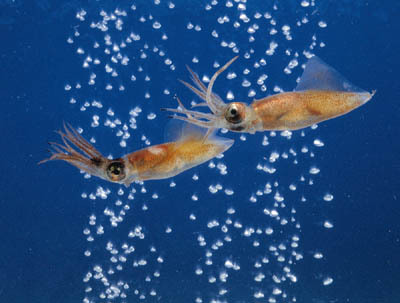 Hotaruika, the name given to this tiny squid was given by a professor of Tokyo Imperial UniversityW who was investigating photogen in early 1900s when visiting Namerikawa of Toyama prefecture. The squid was called ‘Koika’ or ‘Matsuika’ until then. After the new naming to this squid, many researchers, politicians and cultured people came to see the fantastic night view created by the flashing lights of this tiny squid off the shore which spread throughout Japan. This incredible night view was paid attention as one of the tourist attractions of the area which, already in 1910, the sightseeing boats went into service. Hotaruika fishing of Namerikawa, Toyama prefecture. Photo from Totoya Official Site. Hotaruika is sold boiled in supermarkets far from landing harbour. It can be eaten with mustard-misoW sauce, ‘Karashi-su-miso’, or simply with wasabiW, some citrus juice and soy sauce as the most simple menu. Other than easing them simple, they could be cooked into Italian, Spanish, Chinese, Korean like dishes which could be seen in the linked page below. The traditional preserve dish from the most famous landing harbour, Namerikawa, is Hotaruika pickled in soy, called ‘Horaruika no okiduke’, which can be one of your interesting souvenir for you to take it home! 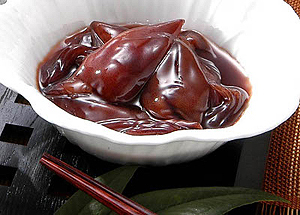 Pickled Hotaruika in soy, Photo from Totoya Official Site. Sightseeing tour of Hotaruika fishing will be held from 3rd April (Thursday) to 6th May this year, in 2014. 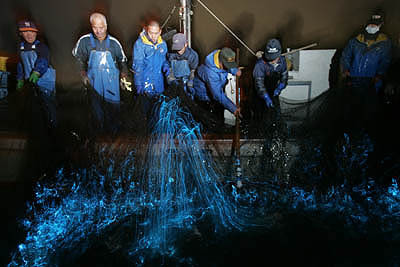 If you have chance to visit the area during the period, it should be great to spend your night watching the fantastic Hotaruika fishing from the boat!! Advance reservation : Advance reservation needed to Namerikawa-shi Tourism Association by phone. Hotaruika Museum Address : 410 Nakagawara, Namerikawa-shi, Toyama pref. Closed : Every Tuesday during 1st June to 19th March. End of the year to New Year. Three days from last Monday on January.